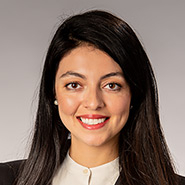 Phoenix — The national law firm of Quarles & Brady LLP today announced that Yalda Godusi, an associate in the firm's Litigation & Dispute Resolution practice, has been appointed to the Florence Immigration & Refugee Rights Project Board of Directors. The Florence Immigrant & Refugee Rights Project is a non-profit legal service organization that provides free legal and social services to men, women and unaccompanied children in immigration proceedings. "The Florence Immigrant & Refugee Rights Project has a long and important history where it has been fighting for justice and providing legal representation to people in need." said Godusi. "Immigration is an issue dear to my heart and I am honored to serve on the Board." Godusi focuses her practice on general litigation matters. She recently received her law degree from Vanderbilt University Law School.